18 Sunnis Found Shot Dead In Iraq : The Two-Way The discovery is reminiscent of the period following the U.S.-led invasion of Iraq when Sunni and Shiite death squads roamed the streets. More than 5,000 people have been killed this year, making it one of the deadliest years in Iraq since violence hit a peak in 2006-'07. 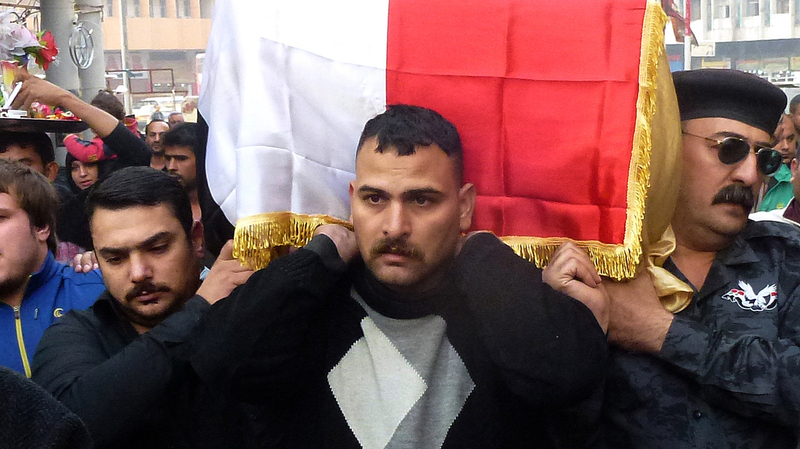 Mourners carry the coffin of a victim of a bomb attack on a Baghdad cafe on Tuesday. Violence in Iraq has spiked this year. The bodies of 18 men were found Friday in a Sunni area near Baghdad. Eighteen Sunni men abducted from their homes near Baghdad by gunmen wearing military uniforms were found shot in the head just hours later, Iraqi police said Friday. "Authorities found the bodies early Friday in farmland near the Sunni town of Mishahda, some 30 kilometers (20 miles) north of Baghdad. Gunmen in four cars snatched the men, who included two army officers and the town's mayor, from their houses late Thursday." The discovery of the bodies Friday is reminiscent of the period following the U.S.-led invasion of Iraq when Sunni and Shiite death squads roamed the streets and carried out abductions. "These recent killings show that the fears by many Iraqis that their country is heading to darker days similar to 2006-2007 are true and that the wounds of the past are not healed yet," Baghdad-based political analyst Hadi Jalo told the AP. "If the government does not take effective measures to stop the sectarian tension and security deterioration, I think that we should expect more such killings." The latest slayings come, as the AP notes, "after police officers found the bodies of 13 men Wednesday in two locations around Baghdad, all killed by what appeared to be close-range gunshots. Some had their hands and feet tied." More than 5,000 people have been killed in Iraq this year alone, making it among Iraq's most violent since violence reached a peak in 2006-2007. A senior police source told Reuters that al-Qaida was behind the 18 killings. Also Friday, a roadside bomb inside a market in the Baghdad suburb of Nahrawan killed three people and wounded six others. A separate blast in Abu Ghraib, another Baghdad suburb, killed one person and wounded five.